Just a very quick blog to let you all know that we’re off to Primavera in Barcelona in a few days time! We will be manning the Petting Zoo Prints & Collectables stall at Flatstock Europe which is held within the festival site and it’s set to be quite an exciting time by all accounts – lots of friends will also be representing their studios and there’s a number on the roster that we’ve not yet hung out with – good times ahead! 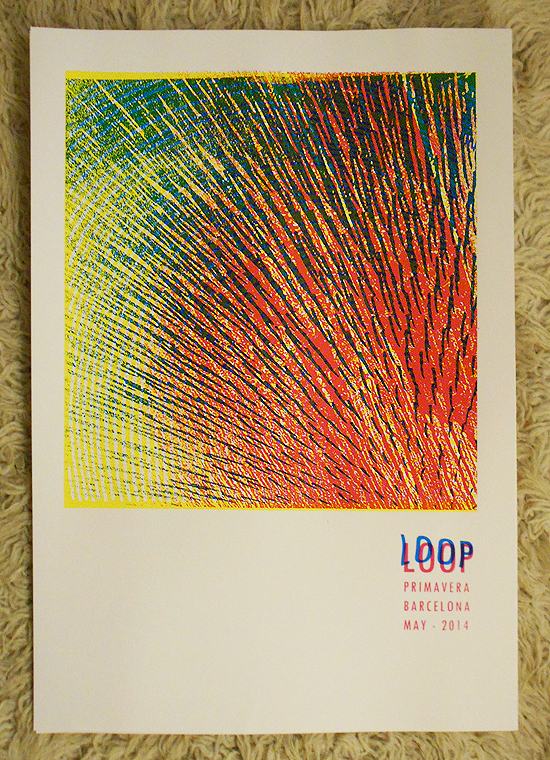 Even more exciting is the news that we have secured a poster by long time favourites of The Zookeeper : LOOP! Focussing more on the sun and heat of Barcelona than perhaps the darker aspects of band imagery that a “soundhead” might have possibly expected, this poster still captures the boom and fuzz and howl of Loop’s hypnotic sound – the basslines of “straight to your heart” and “the nail will burn” were being hummed for lengthy durations whilst this poster was designed and printed… ah the heady days of 89/90 …good memories. We’ll post again when we get back – hopefully with some great photos… there’s plenty more good news to tell about the momentum we’ve picked up since The Stick Up at The Great Escape Festival – for now we’ll just reveal these 3 clues : Pie & Vinyl, Burgess, Wight. This entry was posted in Exhibitions, Festivals, Gigposters, Screenprints and tagged art, barcelona, cmyk, europe, festival, flatstock, gigposter, LOOP, primavera, psychedelic, screenprint, soundheads, spain. Bookmark the permalink.